Lead poisoning is an increasingly common problem in backyard chickens living in urban environments. It is not only detrimental to the bird's health, but also to the humans (especially infants less than 1 year of age) who consume the eggs laid by poisoned hens. In one study conducted on backyard hens living in the Boston area, 98% of the eggs contained detectable concentrations of lead, due to exposure to contaminated soil. 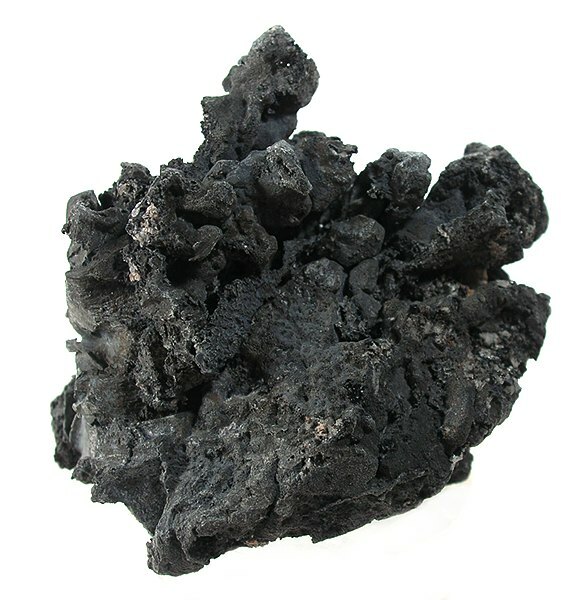 Lead is a very dense metal and a strong neurotoxin. If ingested, since the metal is so dense and not easily oxidized, it will remain in the chicken's GI tract, and slowly get absorbed and released into the bloodsteam, resulting in anemia and interference with the bird's ability to absorb calcium (leading to hypocalcemia, especially in hens). Lead-contaminated soil: There are many ways that soil can become contaminated with lead. Soil located on the side of the road of busy streets is frequently contaminated with lead, since lead was an ingredient in gasoline until the late 1970s. Soil that surrounds older painted structures, as lead-based paint may still be in the soil adjacent the building. Note that 74% of privately owned US homes built before 1980 still contain hazardous quantities of lead paint. The land could also contain lead contaminated waste (batteries, asphalt products, leaded gasoline, lead shot, putty, and spent oil) which may be above or buried within the soil. Any vegetation that grows on the soil will be contaminated with lead, making the vegetation hazardous to chickens who frequently seek out forage to eat when free ranging in grass. Lead-contaminated water: Water can become contaminated with lead if it flows through old lead pipes or faucets--which was common during pre-1978 days. Lead-contaminated food: Food that is stored or left for long periods of time in ceramic glazed bowls or glass (especially for red and yellow shades), or imported from countries that use lead to seal canned food. Building materials: Lead is used as architectural metals in roofing material, cladding, flashing, gutters and gutter joints, and on roof parapets. Sound dampening materials: Sheet-lead is used as a sound deadening layer in the walls, floors, and ceilings of sound studios. 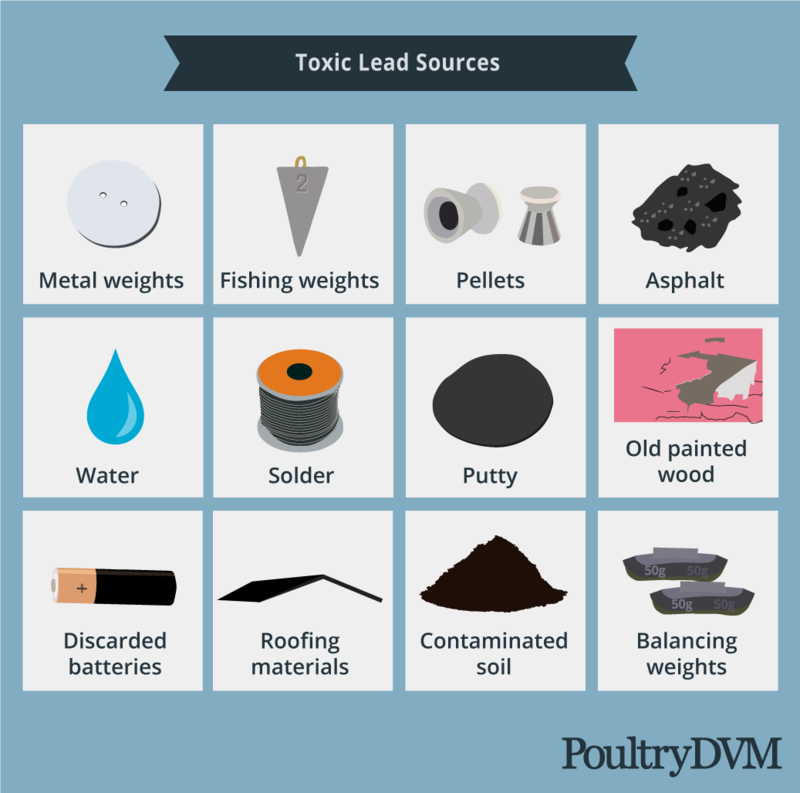 Lead poisoning can present in chickens in acute or chronic form, depending on the extent of exposure or quantity of lead ingested. Acute form: Results in sudden onset of muscle weakness, loss of appetite, marked weight loss, ataxia, drop in egg production and severe anemia. Chronic form: Causes regeneration of motor nerves in the chicken's spinal cord and axonal loss in the peripheral nerves. 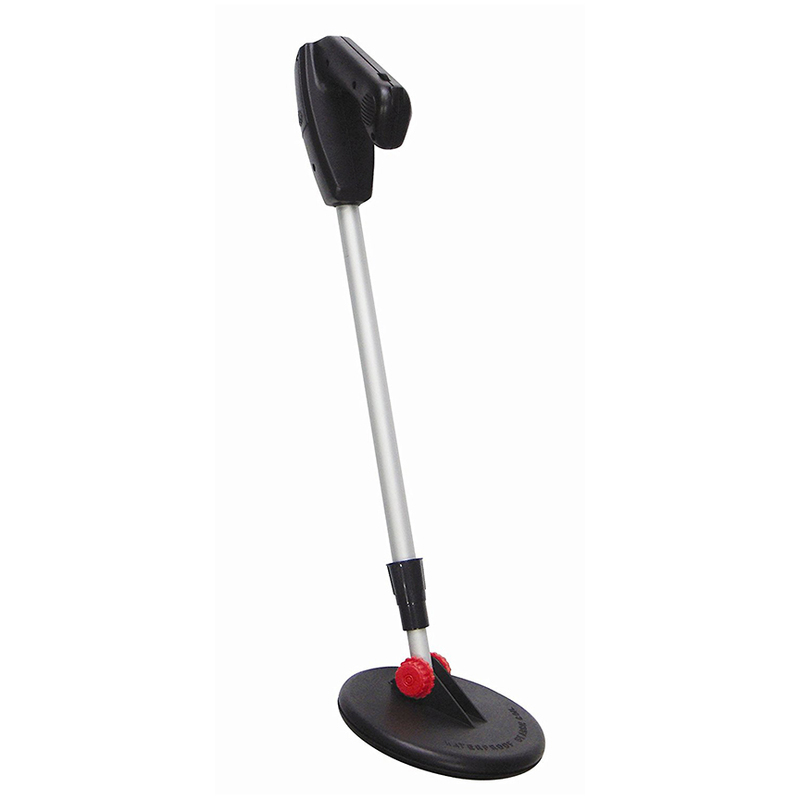 Muscle atrophy and myodegeneration are often also present. Lead poisoning also posses a threat to humans, especially young children, since lead is also deposited into the hen's eggs. Consumption of lead can cause brain damage, high blood pressure, miscarriages, and behavioral problems in children. Lead poisoning can be confirmed through a simple blood test----by sending a small sample of the chicken's blood to a laboratory to confirm the presence of elevated concentrations of lead. Amounts of 11 u/dL and above are indicative of toxicity. In some cases, lead particles may be seen in radiographs, however not in all cases. Treatment of birds with lead poisoning consists of prevention of further exposure (by identifying the cause and eliminating it from their environment), administering chelating agents (as part of chelating therapy), and providing supportive and symptomatic care. Calcium disodium edetate (CaEDTA) 10-40 mg/kg IM, q12h x 5 days, then 5 days off and repeat if needed. Note There should be a clinical improvement within 6 hours of initiating treatment. D-Penicillamine (PA) 55 mg/kg PO q12h x 1-2 weeks on, off 1 week and repeated as needed. Removal of the metal object In cases where a chicken has ingested a lead object that is not passing, your veterinarian may need to remove the object from the chicken's gastrointestinal tract via endoscopy, surgery, or gastric lavage. Provide chickens their feed in feeders, and avoid scattering on the ground. If chickens are enclosed in an outdoor run, prevent them from access the ground soil by elevating the floor using wood pallets, covered with large rubber mats (like those used for horse stalls). 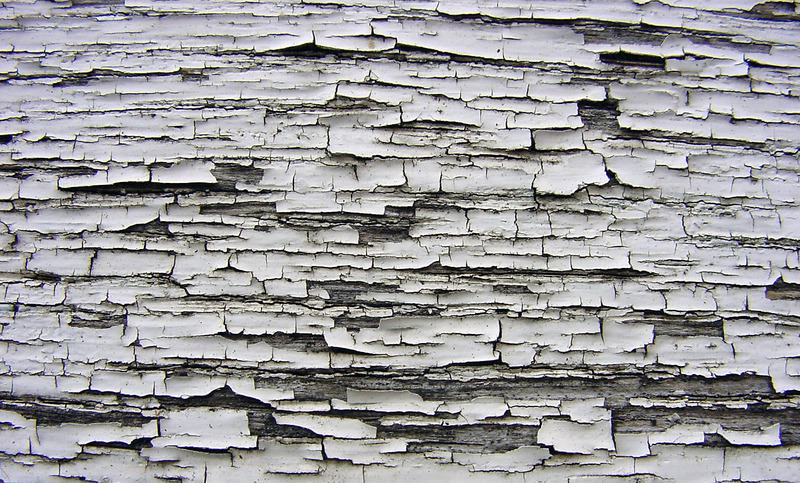 Check exterior paint on old buildings and nearby structures as it can peel or flake off and contaminate the soil. Soil surrounding old, painted structures such as houses, barns, tools sheds, etc. Chickens on a low-protein and low calcium diet will be more adversely affected by lead toxicity.